If you are a fan of The Hangover movies, you're most likely going to love Bridesmaids, the 2011 comedy written by Annie Mumola and Kristen Wiig. Together, Mumola and Wiig came up with a bevy of great lines that are guaranteed to make you bust a gut laughing. And millions have done just that: Since its release, 'Bridesmaids' has become one of the most successful R-rated comedy movies in history! Deservedly so. This movie is seriously funny, boasting an all-star cast that includes Wiig, Maya Rudolph, Rose Byrne, Chris O'Dowd and Melissa McCarthy (one of the best scene-stealers in recent memory). 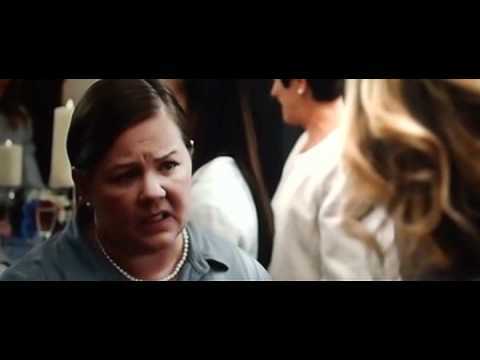 Below are some of the best lines and clips from Bridesmaids, from the whole airplane debacle, to the girl in the jewelry store and Annie's weird roommates to quotes about friendship and love. Looking for more hilarious movie quotes? Check out these quotes from 'Hangover Part 2,' 'Larry Crowne,' and 'Bad Teacher' for a fix! Also check out New Movie Trailers 2012. Chris O'Dowd - Officer Nathan Rhodes. Megan: "I'm glad he's single, 'cause I'm gonna climb that like a tree." Megan delivers this funny line after she's introduced to Annie for the first time. Megan: "I don't associate with people who blame the world for their problems. You are your problem. You are also your solution." This quote comes in yet another scene totally stolen by Melissa McCarthy. She's trying hard to get Annie to see that she can fix what's wrong in her life - without relying on anyone else. It's a truly touching scene that really balances out the humor with a hefty dose of reality. Megan: [belches loudly] "I'm sorry. I won't apologize. I'm not confident which end that came out of." In this scene, Megan lets out a very unlady like belch that leaves her companions disgusted. Annie: "Whatever you say, Stove." Annie: "Stove, what kind of name is that?" Flight Attendant Steve: "That's not a name - my name is Steve." Annie: "Are you an appliance?" Flight Attendant Steve: "No I'm a man." Annie: "You're a flight attendant." Flight Attendant Steve: "That's absolutely accurate." This gem of a quote comes during one of the funniest scenes in 'Bridesmaids,' as a (very) intoxicated Annie tries, unsuccessfully, to sit in first class. Poor Stove. He gets no respect.